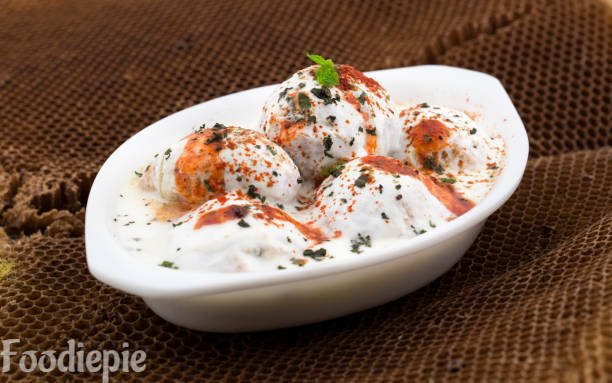 Paneer ke Dahi Bhalle - Preparation of curd made from moong or urad lentils is required before the preparation, but the curd bears of paneer can be made easily. Due to being good but non-food in taste, they can be made in fast also.This is very delicious street food because of ketchup's or sauces.In this recipe used some spices in it to make more spicy and tasty.This is Simple recipe which can prepare at home with few steps.Prepare Vada first and dip in dahi then sprinkle some spices black salt, roasted cumin seeds and red chilli powder over it. Let's checkout recipe. Step 1 : Grate the cottage cheese in a bowl, and peel the potatoes and grate it, add the Cornstarch and mix it, add salt, ginger and green chilli in the mixture and Knead well. The mixture is ready to make vada. Step 3 : Now soak prepared Vadas in lukewarm water fro 7-8 minutes.Oil droplets begins floating on surface and vada would turns softer. Step 4 : After that take out All vadas from water and press them with your palm for removing excess water from Vadas. Step 5 : Transfer them to clean plate. Step 6 : Beat Curd with sugar and salt until it turns smooth. Step 7 : Now Put 3-4 cheese Vadas in a plate. Add Beated curd over it, add black salt, roasted cumin seeds and red chilli powder over it. Now add some sweet sauce and green chutney over it. Now again add curd and a little black salt, roasted cumin seeds and red chili powder. Finally : Your delicious Paneer Dahi Vada | Paneer ke Dahi Bhalle is ready garnish with Green coriander leaves and serve your family.